Residents of 12 states–Arizona, Florida, Indiana, Kansas, Maryland, Michigan, Minnesota, Nebraska, New York, Ohio, Rhode Island, and Wisconsin–will have a happier 2015 thanks to lower tax bills, the Washington Times reported Monday. Wisconsin made the most significant tax cuts, with each family saving an estimated $680 in taxes compared to 2014. Wisconsin Gov. 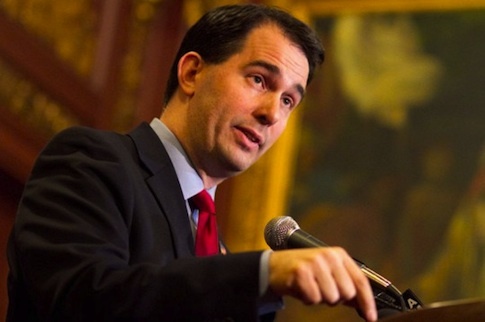 Scott Walker has presided over more than $800 million in tax cuts. Cuts in Nebraska span over the next five years, lowering income, property, and state sales taxes by more than $410 million. Ohio implemented a 10 percent reduction in income tax rates. Tax cuts in these states will not only make life easier for the taxpayers, lowering their burdens in the struggle to survive and prosper, but the states will see stronger economies, with more employed workers to pay more taxes. Legislators, for their part, can go back to their constituents confident of a pat on the back instead of a boot in the seat of their pants. Everybody wins. This entry was posted in Issues and tagged Arkansas, Florida, Indiana, New York, Ohio, Rhode Island, Scott Walker, Tax Reform, Taxes, Wisconsin. Bookmark the permalink.